Probably one of the most frustrating things about building experimental aircraft, especially when starting with a minimum of pre-fabricated parts, is to start building and ending up with an unexpected result. Every builder starts a new project by wanting it to go "perfectly." So when things aren't going well, especially at the beginning, the frustration can lead to an unfinished airplane. This is the first article in a series dedicated to helping builders of the Rand Robinson KR series planes build a straight and true fuselage -- the first part of the construction process. 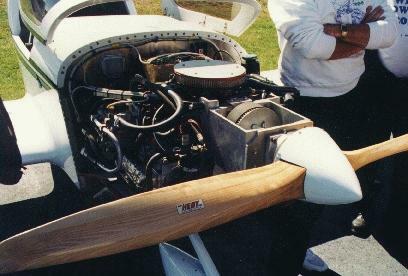 Borrowing from modern boatbuliding techniques, focus will be on the KR-2S, but the principles apply to the entire lineup of KR-1 & KR-2 series planes. While building the KR-2(s) a common surprise is encountered by builders when the completed fuselage sides are laid into position to form the fuselage box section. With many hours spent building the sides flat, finding the once straight longerons that now bow up from the building surface, form a most dissatisfying "banana" shape. Especially when using the preformed fiberglass parts, this curve in the top longeron is not acceptable. The builder is left wondering what went wrong and no amount of clamping or brute force forming will solve the problem to any degree of satisfaction. The problem is not the builder's fault. The solution starts by understanding the three dimensional relationship of the assembled parts being built. 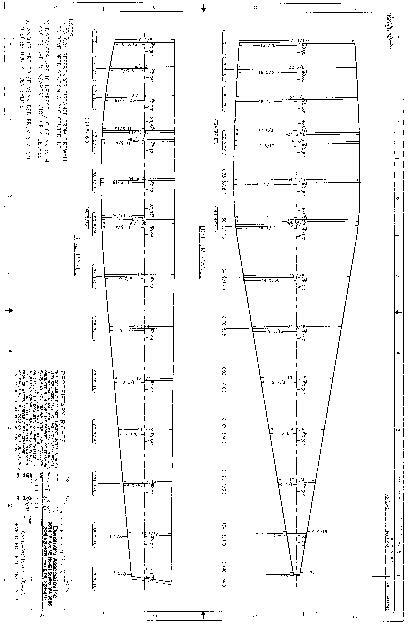 First understand that the plans show the finished form of the plane. They show the "projected" form as you would expect to see it if viewing an actual plane from the top, ends and from the side. Since the sides are sloped (flared) outward, looking from the side, the distances given by measuring the profile drawing are "foreshortened" and don't give the proper shape for building the fuselage with a flat top longeron. What needs to be done is to "develop" the "true" distances and shape of the flat panel so that when it is curved into position, the longerons lay flat. Second, understand that the dimensions called for in the plans put a twist in the sides that tends to work the panel in two directions of curvature. This twist makes the panel "undevelopable" meaning that that shape cannot be unrolled into an equivalent flat shape. This is important when laying out the side and bottom panels onto flat plywood. To illustrate this, try forming a piece of paper around a soda can. The paper can be formed flat around the can either straight or at a diagonal to it's length. It has only one direction of curvature and is by definition "developable". Now try to form the same piece of paper around a baseball. It won't lie flat on the surface without some deformation (folding, wrinkling or tearing) of the paper. The ball has curvature in more that one direction and is a "compounded" shape. Paper (or plywood) can only be readily formed in developable shapes as opposed to aluminum or other metal which can accept in plane deformation. A developable surface is needed to lay out a curved surface when the materials used can't be deformed with any degree of in-plane strain. Initially, the fuselage sides are laid out flat with reference to the top longeron measured to a straight chalk line. 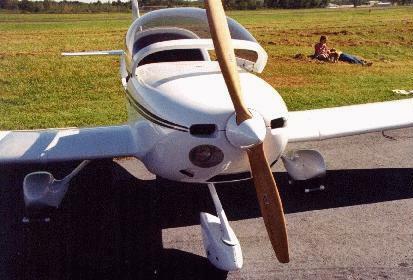 The bowing problem starts when the side panels are bent and sloped to form the fuselage box section. If the sides were not sloped (tumbled home), the section formed would be cylindrical and the longerons would lie flat. Since the sides are tumbled home, the section formed is now conical. When a conical shape is cut with a plane (building surface) not perpendicular to it's axis, the shape formed is elliptical -- exactly what happens with the top longeron. When it's built flat, bent to form a cylindrical section, and sloped to form a conical section, it takes on an elliptical shape firewall to tailstock. This method borrows heavily from proven techniques used in the marine trades. It should be stressed at this point that although the layout procedure is not complicated, it is important to take your time. If the layout is not going well initially, start over! Better to erase layout errors now than to have them built it and cause surprises later. Layout to ensure a fair and true fuselage starts by drawing a reference line (baseline) on the building surface. Refer to figures 2 & 3 and use a wire guide to draw a very straight baseline. About 500 lbs. Of tension should be adequate. One could use a chalk line, but we're talking airplanes here, not house framing. The main layout difference is that the baseline isn't used as a reference for the top longeron. The baseline references the mid point of the firewall for the developed (and true dimensioned) side panel. Although the baseline will still be the reference, the top and bottom longerons will be laid separately. Layout differences don't end there. Each of the stations (vertical members) will be laid out with a calculated separation so that when the panels are formed into position, they land on the spacing called for in the plans. Another major difference is that the bottom & side panels are applied after forming the fuselage box section. This is mainly to obtain the ability to "fair" the side and bottom surfaces and insure a straight and true shape. Refer to figure 1 for the layout of the new developed side panel. The firewall (station a) is layed out perpendicular to the baseline. Longitudinal (station) measurements are given along the length of the baseline from the firewall. Vertical dimensions are given to reference the angle and breadths of the station at the baseline. Notice that the top longeron is bowed outward and that the stations are spaced slightly greater than called out in the plans. When the panels are formed into the box frame section ,they will work into the dimensions specified in the plans. 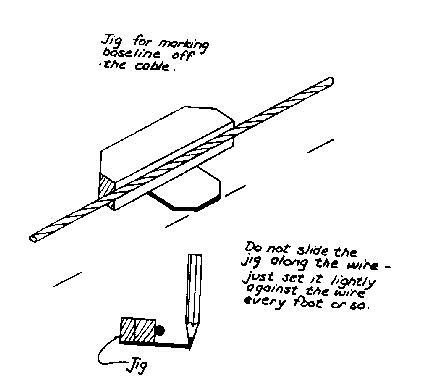 Strike a centerline, longer than is needed on the building surface using a wire guide. Draw off the firewall line perpendicular to the centerline at one end. Using the distances listed in the balloons, mark them off on the centerline. Distances are measured to the nearest sixteenth of an inch. Take time to mark them off carefully. Don't mark off the distances in a cumulative fashion. Use the firewall as a common reference. Using the angles listed at each station, mark off a station line longer than is needed. The angles are measured to the nearest hundredth of a degree. Take time to mark them off carefully. At each station, start by marking off each short (bottom longeron) line distance from the centerline. Use your set of trammels or beam compass for doing this. Mark the intersection of the short line with the station line. At each station, mark off each long (top longeron) line distance from the intersection of the short line distance and the station line. 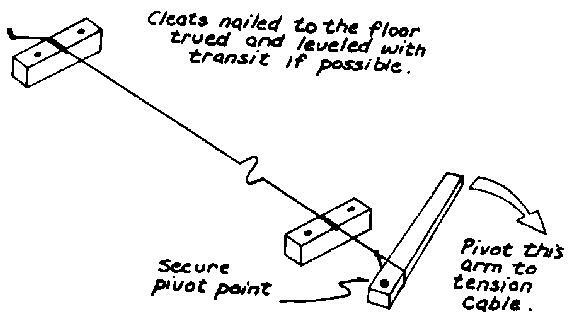 Again the trammels or beam compass is best for completing this step. Mark the intersection of the long line distance with the station line. Using the longeron as a batten, trace out the inside and outside curves of the longeron. After the batten is secure, in between each station, fasten a keeper block inside and outside to preserve the shape of the longeron taking care to avoid potential future interference with the diagonal members to be installed later. The fairing blocks can be removed or left in place if they won't interfere with building. The vertical station members and their diagonals can now be measured and positioned. Remember to refer to the plans for the material thickness direction. After vertical and diagonal members are cut and fitted, take time to draw their outlines on the building surface to cut down on time and confusion when laying out the opposite side. Finishing the side panel is accomplished in a manner similar to that called for in the handbook with the exception that the side and bottom skin panels will be attached later. 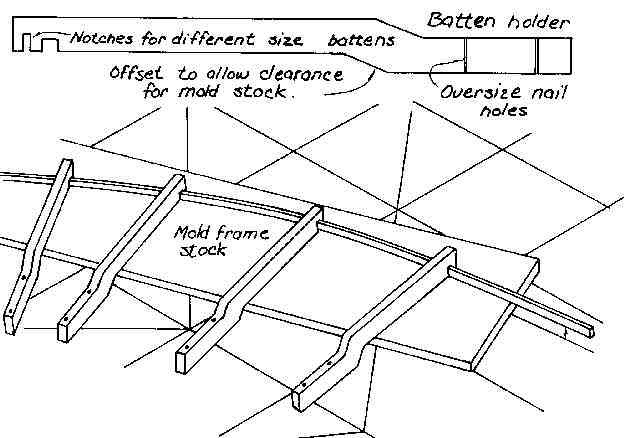 The next article in the series will discuss jigging and building techniques to ensure alignment and straightness of the flat built side panels. Also covered will be building a "strongback" jig to assure alignment of the side panels when they are formed into their final shape. Part 3 in the series will cover assembly of the side panels using the jigs. Some joint details will be discussed that will ensure a stronger and more fair fuselage assembly. Also covered will be the layout & attachment of the side and bottom ply skins. U.S. Mail: Densmore Associates, inc.
ANSI "D" size, computer generated plots of all the layout drawings in this series are available from the author for $30 plus postage & handling. Full (true size) scale plots may be made available depending on demand. "Scarfing" is the practice of splicing plywood so that short pieces of plywood can be used to span long distances. On the KR, it is required on both the fuselage skins and spar webs. The angle of the splice should be 10 to 12 degrees to maintain strength across the joint. Also, joints should coincide with structural members, such as spar webs or fuselage truss members. This scarfer is made by mating a regular plunge router (this one costs about $50) to a table saw. Obviously, you really only need a table saw to cut the chamfer, but it does make a nice heavy table for scarfing. 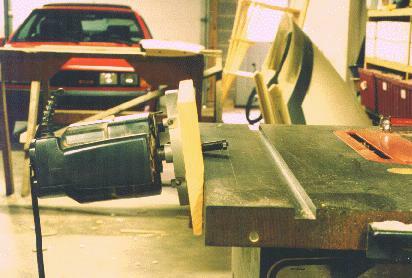 You could just as easily use a large work table as the base.First, set the table saw for a 5.5 degree cut (for a 1:12 joint, or 6.5 degree cut for a 10:1 joint), and run a 1 x 6 through on edge to chamfer a corner on the board. Then drill the board for three router mounting holes (two are countersunk) and connect the assembly to the table saw with two 1/4 inch bolts. Use a long (2-3 inch) straight cutting bit to do the cutting. Adjust the bit so it doesn't interfere with your table top, and go to town. Keep pressure on the plywood to ensure contact with the table while you're scarfing. 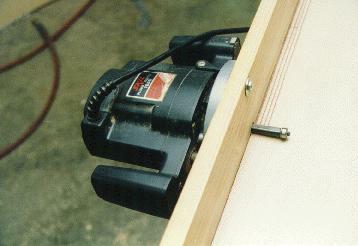 Make sure you feed your material from the same end as you would if you were sawing, or the router will take your plywood away from you and put a big dent in your garage door. In the late 60's Ken Rand and Stuart Robinson were working as flight system engineers for Douglas Avionics. 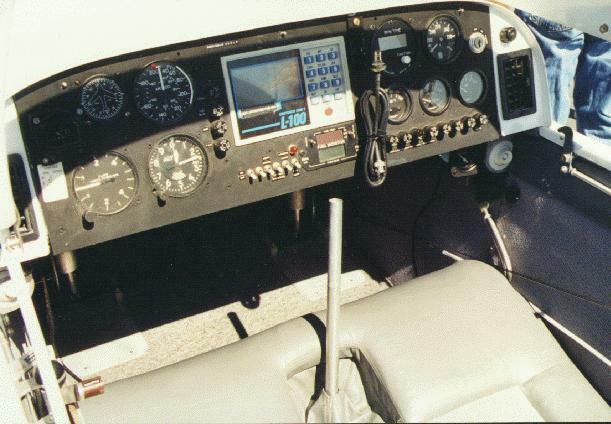 Ken was working as an electrical engineer, having previously worked for Sperry as an autopilots project engineer, while Stu's degree was in aeronautical engineering from Northrop University. They were two of the guys at the end of the DC-8,9, and 10 assembly lines responsible for correcting some of the nits and picks in various systems before delivery to the customer. They both wanted to build a fast, inexpensive airplane which was also economical to maintain. Several designs were considered, and plans were bought first for the Jeanie's Teenie and then the Taylor Monoplane. The Monoplane was more to their liking, but would require some modification to fit their needs. A cooperative redesign effort ensued, with virtually no dimensions left untouched. Only the basic fuselage structure, airfoil, and powerplant were retained. The tail shape was Stu's, and came directly from the big DC-8s parked on the ramp outside his office window. The landing gear was designed by Ken, after seeing the gear on a Dewey Bird at Santa Paula airport. Ken was killed in his KR2 a short time later while flying over Cajon Pass in what was apparently a bad weather / low fuel accident. Ken's wife Jeanette became owner of RR overnight, and stepped up to keep the plans and parts coming. Much of the engineering needs are handled by Bill Marcy of Denver, who's been helping out since early '79. To date, almost 6000 KR1, 9200 KR2, and 760 KR2S plan sets have been sold. 1200 KR2s are estimated to be flying, with 5 KR2Ss now in the air. Much of the development work done on KR's is now done by the builders themselves. KR builders tend to be innovative, which leads to some interesting modifications. Some of the mods that work eventually creep into the plans. The KR2S is a case in point. Many builders who'd heard of the pitch sensitivity and tight cabin of the KR2 began to build an enlarged version, with the length determined by the most commonly available longeron material. The result is a KR2 that is stretched 2" between firewall and main spar, and 14" behind the main spar. 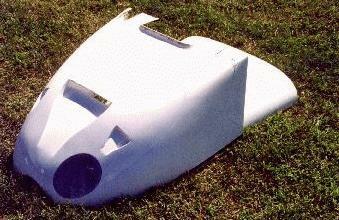 Higher gross weights dictated more wing area, with the new standard becoming the Diehl wing skin. Those who plan to carry passengers commonly stretch the cabin width a few inches, although 1.5 inches is the limit if you still want to use RR's premolded parts. Mike Stearns addresses the KR Forum crowd. This year's KR Forum featured guest speakers Mike Stearns, Steve Trentman, and Bill Marcey. Mike Stearns spoke on several topics, including the many sources for KR and homebuilding information available on the Internet. He also mentioned KRNet, the list server devoted entirely to KR aircraft, as well as several notable World Wide Web home pages. He also brought a sample of the new Rand Robinson wing skins with him, and discussed their high temperature core prepreg construction. His KR2S will receive the first set, which is currently being installed at Hinson Composites. Steve Trentman spoke on his turbine installation. It uses a turbine engine which saw duty as an A7 attack jet starter engine. Total weight is about 85 pounds, while putting out around 90 horsepower. There is a small stockpile of these engines available from government surplus. sources. This engine can only be throttled back to 52% power, which leads to some pretty interesting landings. One inflight failure has been logged so far, with very little damage to the aircraft. More on this exciting development in next month's issue of KROnline. 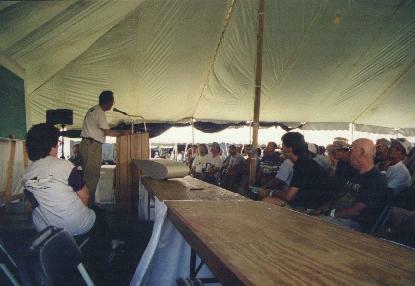 Les Palmer's KR2 N202LP won Best KR2, Best Engine Installation, and People's Choice awards at the 1995 KR Gathering at Columbia, TN. 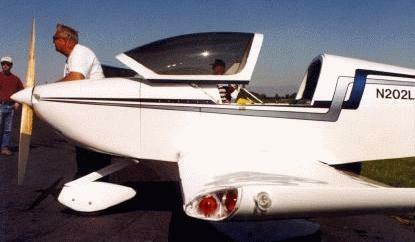 After researching the KR series, and reading Neil Bingham's "A Critical Analysis of the KR2" (Jan 88 Sport Aviation), Les decided to build his as a single seater, stretched 24" in the tail, while maintaining a stock width firewall. His fuselage is made from Douglas fir, which weighs in at 4 lbs heavier than if constructed from spruce. It is skinned with 1/8" birch plywood. Spars are covered with plywoood on both fore and aft sides, ala KR2S. Diehl wing skins provide the lift. Horizontal stabilizer and elevator were stretched 7" longer on each side, while the vertical stabilizer and rudder were stretched 8" taller. . The fuselage to cowling junction was made more graceful by adding 1.5 inches to the height of the firewall end of the fuselage sides. Les's canopy is a Dragonfly, using a four linkage system to swing forward when opening. The canopy frame fits snugly into a recess in the foward deck, providing an excellent wind and water seal. The fiberglass work is exemplary. Seating is luxurious for one. The cowling is also a work of art, and uses NACA ducts for efficiency. Female molds were made for all the fiberglass parts on Les's plane, so he could proabably be persuaded to make more, if demand dictates. Les also machines a multitude of KR aluminum and steel parts which he now offers for sale. The firewall was reinforced with aluminum brackets and angles bolted between the longerons in anticipation of the 200 lb Subaru EA-81 engine installation. His 100 HP Asian version is outfitted with an American Holley 5200 caburetor and manifold. It uses a PSRU of Les's own design, featuring two spur gears with a 1.69:1 reduction ratio and a toothed belt. 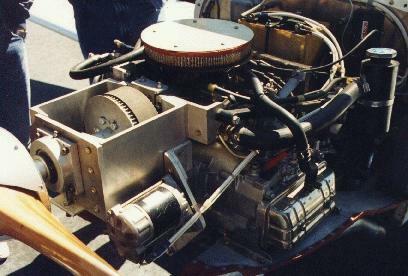 Other than tapping the crank for larger bolts to mount the redrive, no other engine modifications were required. Also, this is probably the only air conditioned KR2 on the planet. The prop is a 60/63 Hegy. Originally built as a taildragger, the fixed gear is made from 4130 steel tubing. Custom cast 6.00x6 aluminum wheels and steel rotors are mated with 6" Cleveland calipers for braking. An early taxi test accident damaged the main gear, and prompted Les to change to tricycle gear. Again, he designed his own fiberglass main gear, and uses a Diehl nose wheel fork with a 4130 strut and 6" wheel up front. Early tests revealed cooling problems, which prompted a radiator move from the firewall to a lower cowling location. The first flight was almost a disaster, as test pilot Randy Smith lost power right after takeoff. He managed a 180 with a safe downwind landing with only minor nosewheel pant damage. The culprit proved to be a spark plug with too much reach, which was quickly remedied. Subsequent flights have shown water temp to be about 210 degrees, oil temp is 220-230, and airspeed is about 180 mph. Shopping for the Partially Built KR. This story starts about twenty years ago when I first started looking at the KR-2 as the plane I'd like to build. The only problem at that time was a lack of money, lack of knowledge, and a lack of job stability. I liked the design, except for the low ground clearance of the retractable gear and that a KR was going to be a tight fit for me to fly. Over the past twenty years I've owned a number of planes, but still always wanted to build my own. I needed one that would fit me, my budget requirements, and have the speed and performance that I wanted. When "KITPLANES" published the article featuring Roy Marsh's new KR-2S, it was the first I had heard of any major modifications or improvements to the same old KR design. I believe that article and Roy Marsh's workmanship have probably been the greatest boon to Rand Robinson (RR) in the last twenty years. It certainly caught my eye! Here was the same design I had decided I wanted to build twenty years ago, with all of the improvements I wanted. It was sitting on fixed gear with some reasonable ground clearance. It had the capability to be built large enough to accommodate me. It has enough prefab parts available that it didn't have to be 100% scratch built if I decided to hurry the project along. And it had the speed I wanted. I knew that Roy's published speeds were probably not realistic expectations for the average KR, but after knocking around for the last three years in my Champ, anything over 90 mph seems pretty fast to me. After purchasing the info kit and the sales video from Rand Robinson, the next step after deciding for sure to build this plane was to order the KR-2 plans and the KR-2S addendum. I finally got my plans and was putting together my first order to start the plane, when my partner in the Champ pointed out that there was a partially completed KR-2S for sale in Trade-a-plane. My initial answer was "No, I don't even want to look at it. I want to build my own from scratch." My partner insisted that for the advertised price and the fact that it wasn't too far away, I ought to at least give the guy a call and investigate it. "No, I don't think I want to buy someone else's problems," I persisted. That night I went home and crunched up some numbers on the calculator and finally came to the conclusion that for the sake of my budget for the next several years, I really should give this guy a call. Three days later, I flew to his place about 400 miles away to take a look at his project. At this point I should probably mention that I consider myself to be fairly knowledgeable about airplane construction, although the vast majority of my experience is with tube and fabric. The rest of this article deals with what I looked for and more importantly what I missed and have had to repair in the last year since I purchased the project. When we went to the seller's house, I found that the left wing was built using the Dan Diehl wing skins and the right wing skins were leaning against the wall inside the house. Also the canopy was in the house with the canopy covered with paper and tape. I wanted to inspect the fuselage first, so off we went to the shop. There I found a fuselage sitting on it's gear painted in primer gray. The first step was to inspect the quality of workmanship of what could be seen as it sat. The interior of the fuselage looked as if it had been built with a great deal of care. The fit and finish of all of the interior wood was very nice. Even the gussets looked like they had been painstakingly perfectly fitted. The glass work on the turtle back also looked very precise and clean. It was evenly faired into the vertical and horizontal stabs. The tail also appeared to be well built with the exception of a depression directly over the front and rear spars in the horizontal stabs. He explained that when he moved recently, that he had shot the plane with gray primer to protect it from the weather since he wouldn't have ready access to a shop to put it in right away. It ended up sitting out in the hot south Texas summer sun for a few weeks before he got a shop rented to work in. That caused the glass (or possibly the foam inside the horizontal stab) to swell, except that it held onto the spar, so it was slightly ballooned in front of and behind the spars. His recommendation was to fill it back smooth with micro. I also found a small linear crack in the lower left wing spar cap on the left wing stub. It appeared to be from over tightening the rear spar wing attach fitting bolts. His explanation was that the crack wasn't important because the rear spars only job is to keep the wings from folding back. I also noticed that the holes for attaching the outer wing to the wing stub were badly rounded out on the rear spar. He explained that the Diehl wing skins require the rear spar to be swept slightly more forward than the stock wings. This won't allow you to use the rear spar attach fittings from RR and that I would need to fabricate a new set of rear spar attach fittings. I also found that the aileron bellcranks were not built or installed as per plans, but found that they looked professional. I couldn't check for function since the right bellcrank and sheeve wasn't installed, the left wing also wasn't installed, and the right wing didn't exist yet. Next we pulled the inspection panels off of the fuselage and tail and looked at everything I could see with a good flashlight. I didn't find anything else that might be questionable about the fuselage except for a cracked elevator trim tab that was damaged when it fell off it's hanging place on the wall. Next we spent some time going over his builders log and builders photo album. I still hadn't seen anything that would dissuade me from buying this project. At this point it was starting to get late and my ride down needed to get airborne for the flight home. I needed to make a decision about whether I wanted this project or not, but I hadn't inspected the wings and canopy yet. I took a cursory look at the left wing and saw lots on micro built up on it and some bubbles in the leading edge, but nothing that looked seriously wrong to my amateur eye. The right wing was only a set of spars in the shop and the Diehl wing skins in the house, so there wasn't much to look at there. The canopy was wrapped in paper and tape, so there wasn't much to look at there either. I decided that even if there were serious problems in the wing that was built, I would be money ahead to go ahead and buy the project. For the advertised price, I could build a new set of wings and still be way ahead financially. We negotiated a final price, shook hands, took my ride to the airport, and started off in search of a U-haul to haul the project home. Now, at this point, some of you are thinking about what I surely must have forgotten to inspect and why didn't I take a local A & P or EAA member along for the ride. First of all, I don't know any mechanics locally that have any experience with glass and our EAA chapter of which I am VP is woefully lacking in fiberglass knowledge. Secondly, as you will see, I missed plenty. Some by ignorance, some by just not looking close enough. Now for a list of the problems that I found over the last year and a few of the fixes that I came up with. I found that the lower set of rear spar attach fittings on the left rear spar were installed backwards with the longer spaced hole towards the fuselage. Since this is the same place that also had the cracked spar cap, it required a major change. Also in the same area he had drilled through the rear spar with a hole saw to create a place for the aileron cable to pass through and managed to cut out the second from the outside vertical brace in the spar. Then he chose to install the aileron bellcranks in front of the rear spar, and cut another hole through the rear spar for the aileron push rod. He also managed to cut out the outside vertical brace in the spar. Since the holes were already drilled through the spar, the choices were to either cut out that section of spar cap and scarf a new piece in, cut the whole rear spar carrythrough out of the fuselage including ruining the left lower wing skin, or do something else creative to reinforce the spar cap and install a custom built set of attach fittings. I also found that after I built and installed the right side wing stub ribs and skin that the aileron bellcrank setup would not work as installed. The cable that crosses between the two bellcranks had a sharp uphill from the sheeve to the bellcrank in the last 12 inches on either side. This combined with the radius that the bellcranks turn caused the cross cable to pull up tight when the ailerons were pushed to either end of their travel, but allowed the cables to go very slack when the ailerons were centered. Also the Aileron pushrods needed to pass directly through the lower set of rear wing attach fittings to attach to the aileron. This whole rear spar and aileron bellcrank setup was going to either have to be redesigned or cut out and built to plans. The bottom line is that the problems I observed when I inspected this part were much more serious than expected when I had to fix it. I decided that I had to remove the rear fittings from the left wing to be replaced with the new set that my neighborhood machinist was cutting out for me. When I put the wing on the work bench to start removing the rear fittings, I thought I had better take a closer look at the bubbles in the leading edge. I found that as I pushed on the leading edge, it delaminated between the glass lay-up on top and the upper and lower wing skin edges that were floxed together underneath. I concluded that that area had to come apart and took a belt sander to the leading edge. What I found was that the leading edge had been floxed together and glassed over, but the mold release had never been scrubbed off the leading edge of the wing. It peeled apart for rebuild quite easily. When I got back to removing the rear spar attach fittings, I noticed that the woodwork inside the wing looked awfully dull. The reason was that the wing had been closed up without varnishing any of the woodwork. This was rectified with a small hole saw, a number of extensions and a modified undercoating sprayer. I also found that the aluminum drain fitting in the bottom of the left wing tank had been glassed into place upside down. The tapered pipe threads were tapered the wrong way to install the draincock into the tank. Retapping the fitting the right direction seemed to be a good fix for that problem. When I finally got around to attaching the wing to the fuselage, I found that the front spar attach fittings were badly misaligned. Although they could be forced into alignment, I didn't think I needed that kind of preload on the main spar fittings. This problem was fixed by calling on my local neighborhood machinist to build me an aligning fixture and reaming the attach holes to the next larger size and ordering the new sized bolts. On the fuselage I found that although it had new Cleveland wheels and brakes on it, one of the brakes had a severe wobble to it. I must complement the manufacturers for taking care of that problem. One call to the Cleveland factory and they shipped me a new set of wheels and brakes even though the receipt for this set was over four years old and in the original builders name. Their only concern was that this set had never been placed in service yet. I chose to sand the load of micro off the left wing to see what it was covering. When I got down to the glass, I found that there was no glass for the aft inch and a half of the underside of the wing in front of the aileron hinge. With the Diehl wing skins, you build the wings, then cut the ailerons out of trailing edge of the wing. He had mismeasured and cut too much material off the bottom side of the trailing edge in front of the aileron. It was filled by floxing a piece of spruce into the gap to fill the space between the back edge of the fiberglass and the aileron mount. I chose to wrap the trailing edge of that wing, and the other wing to match with a couple of lay-ups of glass. When I sanded the primer off the aforementioned damaged trim tab, I found that the hinge was floxed to the leading edge of the foam insides of the tab, but not the glass. I also chose to wrap the front of the trim tab with a lay-up of glass. I decided to pull the paper off the canopy and take a look at it before I'm ready to bolt it on and fly. The original builder had blown his own canopy and after some of the previous problems, I was beginning to have some concerns about not having looked it over closely enough. The canopy turned out to have been blow a little too large. It ended up with a little larger bubble for headroom, which I didn't object to. However, it had more headroom on the right side than the left. Yes, it was just a little bit lopsided. The main problem was that the canopy is stretched thin enough that it can be easily pushed in with one hand when the weather is warm.. My fear was that this is just thin enough that it may decide to lay on my head or in my lap when flying on a warm day. It will have to be replaced. I'm sure that many that are reading this could see several of the potential problems before I mentioned them, but some others may not have and I'm sure that there could have been many other problems that didn't but could have existed on this project. This is also not intended to be critical of the gentleman that started this project as many parts of it, especially the wood work are better than I could have done and much of his work is outstanding. I prefer to think that I'll end up with a better plane with his woodwork combined with my glasswork. This article is intended to feature some of the problems that you may run into in buying someone else's project. The final question is, knowing what I have found over the past year, would I have still purchased this project. The answer is yes, but primarily because the price was right in that I am still money and work ahead of where I would be if I had started the project from scratch. There are a few things that I would have done differently, but nothing that I can't live with. Although I won't be able to say that I built it all from scratch, I have built and rebuild enough of the plane that I should have no problem qualifying under the 51% rule. You can send comments directly to the author via e-mail at "jscott@LANL.GOV". Here is an brief explanation of how I built my turtledecks. The jig was constructed from scrap plywood and a few 1x4s that I ripped into stringers. I made two temporary bulkheads from the plywood, one for each end. 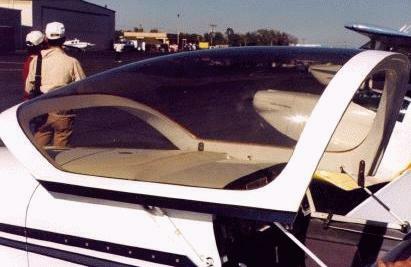 Remember the forward bulkhead needs to be shaped in a way that will closely match the aft end of your canopy frame. Make an aft bulkhead by placing a straight edge at the top of your forward bulkhead and the trailing edge of your horizontal stabilizer. This will give you an idea of how tall your aft bulkhead needs to be. As far as location, I placed my aft bulkhead just forward of the lower/front of my vertical fin. I constructed the jig on the fuselage, it is glued together with automotive bondo. After the bulkheads were bondoed to the fuselage I used the stringers that I ripped from the 1x4s and bondoed them to the bulkheads. This gave me a male form to cover with thin plastic or posterboard. I stapled two layers of posterboard to the jig(thin plastic would work better). 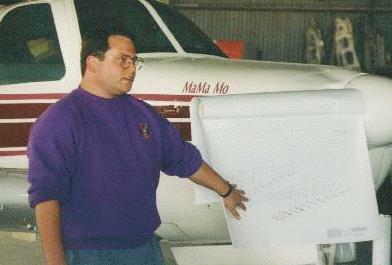 The posterboard wraps down two inches onto the fuselage. After I was satisfied with the way it looked, I then covered the entire thing with duct tape (fiberglass will not stick to duct tape) On top of this I wetout one layer of tri-ply cloth (22oz) that I had left over from an earlier project, and one layer of 8oz. bid. Remember to mask off your fuselage so you don't get epoxy on it. If you are not familiar with composite lay-ups, you should plan on razor cutting your lay-ups 4 to 6 hours after wetout while the lay-up is still soft enough to cut with a razorblade. After the lay-up cured (2 or 3 days) it was removed from the jig, and the jig was removed from the fuselage and discarded. (be careful, the bondo sticks very well to the spruce, you could splinter your wood during removal) I now have a fiberglass skin that tends to hold the shape of the jig but is still flexible enough to work with. I made two bulkheads out of 1/4 last-a-foam (AS&S) using the plywood formers from the jig as a guide. I covered these foam bulkheads with one 8oz layer of glass on each side, with a glass to glass edge on the bottom. After cure these bulkheads were bondoed into place (to the fuselage)and the fiberglass skin was pulled down tight and floxed to the bulkheads. When the flox cured the bondo joints were broken, again being careful not to harm the wood. The turtledeck was removed from the fuselage and 2 inch tapes added to the bulkheads inside and out. At this point the turtledeck looked great and only weighed about 5lbs. but I noticed you could deform the skin by pushing hard on the outside. So I flipped the turtledeck over and from 1/4 inch last-a-foam, I cut two inch wide strips that would run the entire length, forward and aft inside the turtledeck. In effect these would act as composite stringers, I made enough of these two inch wide strips to make up three stringers. One down the center (sort of a backbone) and one on each side of the "backbone" half the distance to the edge of the turtledeck. I sanded the edge of the foam so that when covered with a layer of bid @ 45degrees there would be a nice transition from the turtledeck skin up onto the foam and then back onto the turtledeck I scuff sanded and glued the foam stringers in with micro. I covered the foam stringers with one layer of 8oz bid @ 45degrees. You can also send me email at: mikemims@pacbell.net if you have any questions or want to share your ideas. KROnline is an online KR Newsletter devoted to sharing KR information with other builders and pilots in a timely manner. The first issue (September 96) is now available as a zipped MicroSoft Word file at http://members.aol.com/bshadr or as an html document at kronline9.html. If you'd like to submit articles or photos, email Randy Stein at BSHADR@aol.com ------------------------------------------------------------ Don't bother to email Randy though. KROnline has been retired since the KR Newsletter has improved.